Wi-Fi free breakfast and parking (near the mall and a short trip from the area's popular casinos) are highlights at the budget-friendly Microtel Inn & Suites Bossier City. All 101 rooms at the four-story Microtel offer Wi-Fi a coffeemakers premium cable TV work desks and free local calls. Some rooms come with a microwave and refrigerator. Save money by fueling up at the free continental breakfast. Pets are welcome and laundry facilities are available. Advanced online check-in/out makes coming and going a breeze. 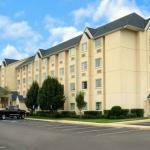 Just off I-20 the Microtel is less than a mile from the Pierre Bossier Mall and two miles from the civic center. It's four miles from Barksdale Air Force Base. The DiamondJacks and Horseshoe casinos are three miles away. Drive 10 minutes to visit Harrah's Louisiana Downs or the Louisiana Boardwalk. Top Shreveport attractions â?? including the planetarium at Sci-Port convention center Barnwell Garden & Art Center and the Red River Entertainment District â?? are 10 minutes west. Shreveport Regional Airport is 10 miles away.